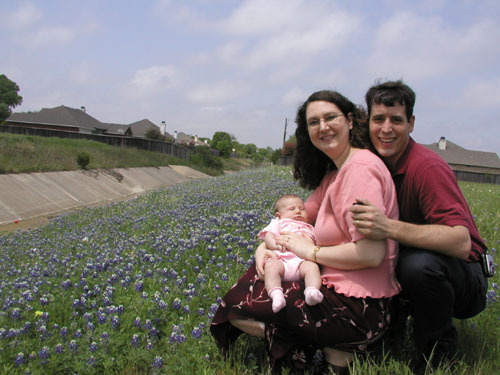 Sadie was just about a month old, so we didn't want to take a big trip to find bluebonnets. These were within walking distance of our house. We went to a house in Friendswood where the owners let people come into their front yard and take pictures in the bluebonnets. They even have a scrapbook out with pictures people have shared from previous years! The owners are an older couple from my parents' church, so while we were there, we went inside for a visit. We drove down to Brenham and met Maw-Maw, Paw-Paw, Maw-Maw Esther, Uncle Keith and Erin. 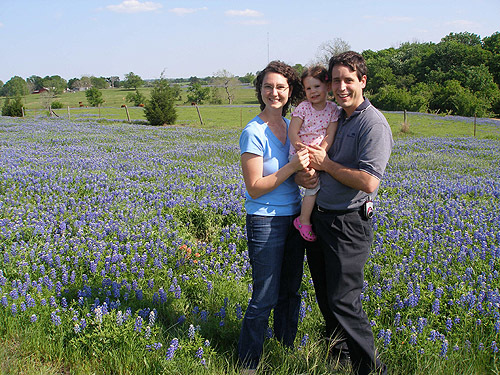 We all piled into the van and drove around in search of great fields of bluebonnets. These were down a little country road that was part gravel. After we all took tons of pictures, we drove to the Blue Bell ice cream factory. They weren't open for tours, but the ice cream shop was open! Yum! Oddly enough, the day after we took this trip, it snowed! Driving back from Houston, we took a detour through Brenham and stopped at a field by the side of the road. It was a very windy day, but loads of people were out taking bluebonnet pictures- including some teenagers dressed in Renaissance Fair outfits! 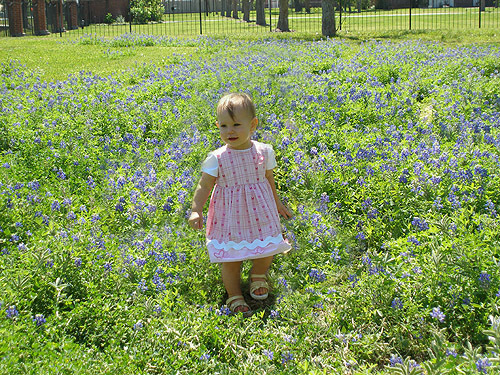 I think this counts as Ivy's first bluebonnet picture- she's there in my tummy! 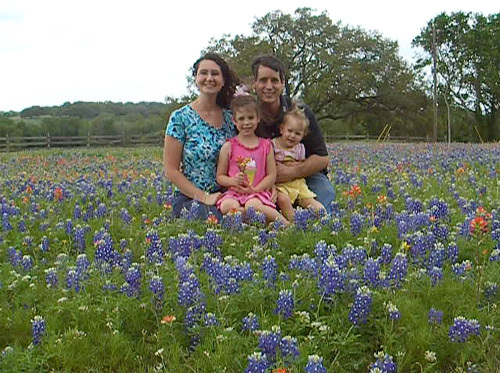 We didn't have to go far to find these bluebonnets... They were in Maw-Maw and Paw-Paw's new back yard! We got to visit them often- we saw the little patch grow thicker and thicker and eventually go to seed. 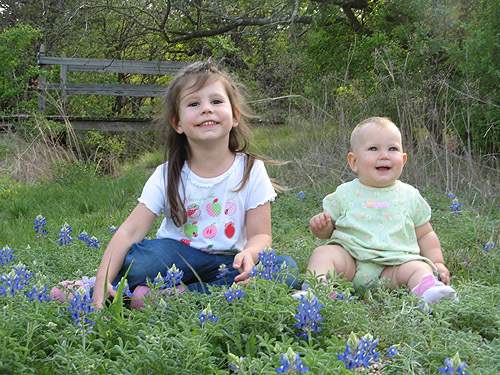 We're excited to see if even more bluebonnets show up next year! Both Sadie and Ivy picked a few... Sadie put hers in a cup on the kitchen table. Ivy put hers in her mouth. We drove with Maw-Maw, Paw-Paw and Maw-Maw Esther down to Independence to the site of the original Baylor. 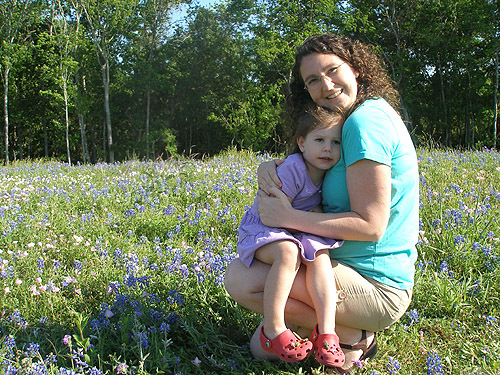 The bluebonnets and other wildflowers were beautiful, and we got to climb up a neat leaning tree. After visiting the Baylor site, we went to the antique rose garden nearby. The girls had a blast looking at all the flowers and fountains. Then, since we were so close, we had to go to Brenham to the Blue Bell shop! After an ice cream snack, we went to a city park with three awesome playgrounds for a picnic supper. I think Ivy went down the tall tunnel slide about 20 or 30 times!